Automatic deployment is become widely accepted more and more. After the general deployment systems also products are available adding specific deployment mechanisms. One of these is the installation (and configuration) of Terminal Servers combined with Citrix Presentation Server. Also the Enteo Management Suite (of FrontRange Solution)s offers a specific management suite for Citrix Presentation Server. With the new version 6 they rebuild their product with a simplified installation process, a full new simplified management console and lots of new features based on customer experiences. This new V6 will be reviewed in this article mainly based on deploying and maintaining Citrix Presentation Server infrastructures. Do not forget that the same product can be used for installing operating systems, patches and applications on other servers and workstations and much more. I understood that the installation of the earlier versions was a little bit difficult, because you need to choose your needed parts out of lots of sub installation. Now the installation starts with a language selection and showing you a selection menu which "type" you would like to install. If you choose the Citrix Presentation Server "type" the Citrix component of the management suite will be added to the installation. During the installation the program does not check the requirements; those will be displayed after the installation of the files on the disk in a kind of setup environment wizard. The installation is further straight forward; the only question you get is specifying where the files should be stored and how this folder should be shared. This wizard starts with your infrastructure setup. You can specify the security requirements dependent on which option you choose. You will need to have one to three accounts for the Enteo infrastructure. After selecting the wanted situation you specify the account by selecting it out of the Active Directory (so be sure you created those accounts in advance). Next the wizard is checking the requirements (Windows 2003 Server, .Net 2.0 and IIS), before you need to configure the database (Only MS SQL supported). If you choose to host the database on another server you need to configure the MSDTC manually. After specifying the database the product is finalizing the installation/configuration of the product. During all the options you can choose the automatic configuration of Enteo or set all the settings manually. I expect that the automated way will be used the most. Both the initial configuration as the daily administration is done using one console, which is located in the Enteo share. This makes it possible to start the console from every machine in your network. The First Step is configuring the Enteo infrastructure within the view Manage Infrastructure. First of all you configure the general options for the infrastructure like intervals, logging levels, location of files and so on. For installation on (Terminal) Server you need to enable two settings for server that are secured by design. With these settings Enteo prohibits to install anything on servers, which could be valid if you are using the product for workstations only. It is a pity that these settings are not enabled by default because I selected the Citrix Presentation Server set-up during the installation, so it is logical that I would like to install software on servers. Like such options you can add components for fault tolerance and dividing the load like an additional management point, repository or depot (for example for branch offices). You can also add additional accounts for administrating the infrastructure. Second step to set-up the environment is to create a reflection of your environment for computers and user to assign the packages to. This is done within the view Manage Computers & Users. Probably the most useful is to import those objects out of your current environment. Enteo supports importing Active Directory Settings and Citrix Farm settings (if already available). You can also build up your own structure manually or using an import based on CSV file. Within the same structure you can define your Citrix Farm(s). This can be done anywhere within the created structure, but logically you will do this in the OU where your Terminal Servers are stored. Via the New Citrix Farm you need to specify the Farm Name (this will be logically used during the installation as the name of your Farm). After this creation of the Farm you need to create at least one Zone. There is much more possible to configure within Enteo to set-up your environment, but this basic configuration is enough to use the product to roll out a server with an operating system, Citrix Presentation Server and software, which we will define in the next paragraph. Enteo can be used to install the operating system, Citrix Presentation Server, application and patches. For this review we will focus on the operating system, CPS and applications. The creation of these packages is done via the Manage Software View, which will lead you to the Global Software Library. Within this library you already will find a predefined structure, which can be extended to your own needs. For example you can create a folder per CPS Silo for the applications. Logically a server needs to have an operating system so let's start with this component. The possible packages are displayed in the mid-below pane on the Software Factory tab. To start an operating system package simply click an OS installation. This starts a wizard where you define which operating system you would like to use (Type of OS [W2003, Vista, XP] and version [R2, x64, 86x, standard and enterprise]) and the installation method. Enteo supports both unattended and imaging. For imaging Acronis components are licensed, making sure that already existing Acronis images can be used within the Enteo Management Suite. Enteo has already defined templates for all the operating systems. For Windows 2003 (which I will use for this review) you can choose DC, Member or a Citrix Presentation Server as options. Next you will need to add the installation sources to the Enteo infrastructure by specifying where the wizard can copy those files from (because it is a straight copy you can use the set for several installations). 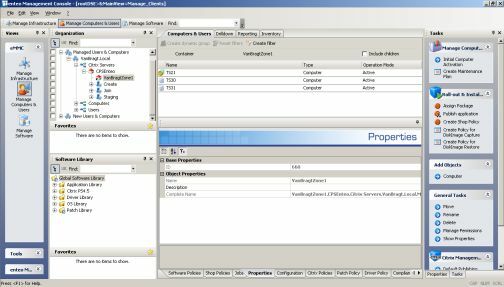 The wizard shows the available jobs in the configuration package (like formatting, partitioning and the actual installation of the OS) and you can add or remove jobs if necessary. Now the Windows 2003 installation package is configured completely, we can start adding the Citrix Presentation Server package. This is done by right click on a folder (which will be used as the store for your CPS installation set) and selecting Citrix Management - Import of prepackaged Citrix Applications. Again a wizard is displayed asking you to provide the location of the CPS installation sources. 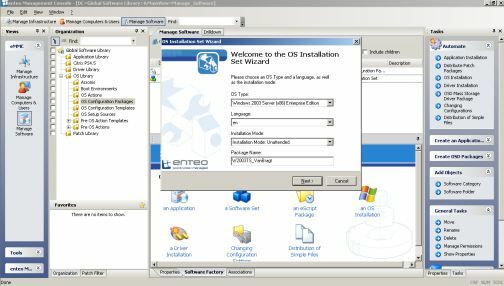 The wizard reads the installation source and will determine which predefined package of Enteo matches the software for example CPS4.5 32bit and the license server can be found. You select which predefined package you would like to use and the corresponding packages are added to the library. Because the packages are completely predefined the package is already complete to be rolled-out (as described in the next paragraph). Of course also applications need to be available on the Terminal Servers. Within the same component also the application packages can be created. 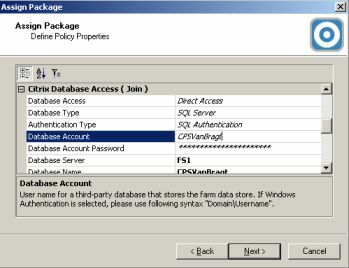 An application Package is started via the Create a new Package for an Application. 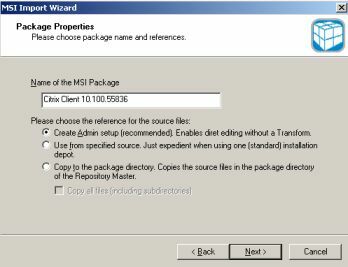 Within the wizard you can choose two types of packages: a MSI package or an E-script (NetInstall Spy) package. With the MSI option you specify the MSI package and choose the option to perform an administrative install (to create the corresponding MST file) or only use the MSI to be executed. I think this method is a nice way to create customized MSI based packages. The eScript package is Enteo's own way to create application packages. This is done using a recording technology (just like other package creators) by making snapshots, followed by determining the deviation between the two states. Beside these two default methods it is also possible to execute your own create (installation) scripts. The packaged applications can be combined into an Application Set. Just drop the applications into the workbench component and determine the installation order. Using the same you can create package configuration changes (desktop configuration, application settings, system settings and so on), driver packages (really easy by selecting installed devices on the computer or specify the installation source) or simple file copy packages. Because of the target of this review I will go in detail within this component. The Manage Console of Enteo is actually a shortcut to an executable on the Enteo share. Actually this is really nice. In this way you can use any machine to create the packages without installing any additional software on the machine. What I also really like is that despite which type of package you are creating the same workbench application is being used to create the package (showing the corresponding features and options), so you familiarize with the tool quickly. When the package is created it should follow the workflow created within Enteo. First the application needs to be ready for distribution. Also you may perform a pilot installation of the application package before it will be deployed in production environments. In this way Enteo is supporting the DTAP process. An application package won't show up in the console for deploying (described in the next paragraph) if the procedure is not carried out completely. When all the packages are created it is time to install them on the machines. Deployment is based on groups (which can have a dynamic or static character) where you can assign package to and "connect" an object within Enteo (Computer or User). Secondly you should consider a maintenance plan for each object (or group of objects). Enteo will use the time specified as maintenance times as the time available to deploy packages. The maintenance can be assigned to a different group than the group used to deploy the packages. In such case you create one group for deployment and more groups with different maintenance windows. With the maintenance windows also a state of the object can be specified. For example a maintenance plan can be created with the state of Citrix Presentations Server, so the maintenance plan will only be applied if the server has CPS already installed. It is nice that the product is showing in the configuration tab that an object is not compliant with the maintenance policy. After this general deployment scenario let's go a little bit more in detail on some subjects. The Operating System will be deployed using the PXE option of the clients. Enteo supports both DOS and Windows PE based booting mechanisms. Unfortunate in some way the PXE part failed in my test environment, but Enteo showed me that the process to guarantee that the process is working as expected. After the Operating System is installed, we can continue with the next step. For deploying Citrix Presentation Server you choose the Assign Package wizard. In the wizard you select the imported CPS package, which will be followed by specifying the parameters for the installation of Citrix Presentation Server (the same options when using an unattended installation). Remember that Enteo does not create the database for you (when using SQL) and this should be available before starting the roll out of the first server using the Create Farm. When the Assign Package wizard is finished you can connect a Terminal Server to this group and when the maintenance window permits the installation will start. The progress of the installation can be followed on a very high level in the console or on a detailed level on the object itself. Beside the deployment of CPS Enteo also offers the automatic creation of Citrix Published Applications. Deploying applications is based on the same steps. 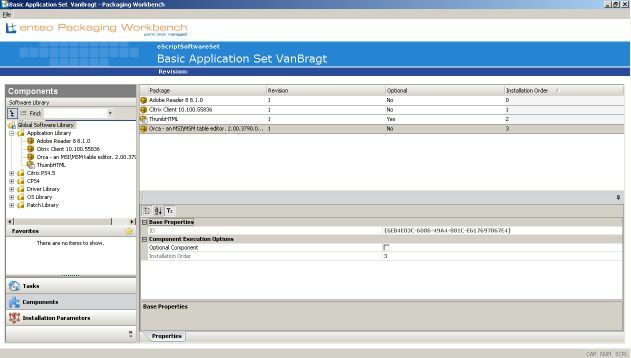 Again you select Assign Package and walk through the wizard (logically the Citrix configuration will not appear). Besides the above described functionality Enteo also offers much more functionalities via optional modules. Examples are patch management, inventory, Remote Control (which have some really cool features) and so on, which provides additional management in the product. If you take a look at the management features in the Citrix Presentation Server version you can check on the Enteo's server the state of services and the level of your Enteo infrastructure. On object level you can view on the tab Events the actions on that object. There is also a portal where you can view several items like a summary of the installation, object properties and configuration. With this new version Enteo made the product much more convenient to use than the previous versions although the product has still a learning curve to become familiar. This is also due to the overwhelming possibilities. The standard interface for editing packages in the workbench tool is really great to become familiar with the options available. It is also great that the product is delivered with default configurations for installing operating systems and Citrix Presentation Server. Also the possibilities to build application and driver packages are satisfying the needs of most companies. It is a pity that there are some slight imperfections in the product (like the mentioned settings to install on a server) and that the console is not really quick. Expandable with additional modules for clients, patch management, remote control and more. Slight imperfections and the console is a bit slow.